About Tadeo de B. A.
Jesús likes to paint and dance. He likes to play and paint at Kindergarten. He likes to go to school and he’s very cute, loving and sometimes could get a little angry. He has a lot of friends, and he helps to his parents by picking up his toys. He suffers from Freeman-Sheldon Syndrome. When he grows up, he wants to be a doctor. 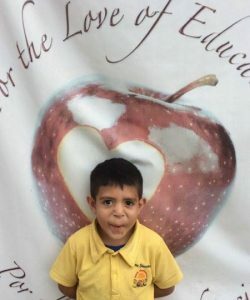 His mother María has a Secondary Education. Her health is regular and she is a housemaid. His father José has an Elementary Education as well. His health is good and he works at water purifier service. Home: Juan shares his home with his parents and two siblings. They rent the house and it has a living room, a bathroom, a kitchen and a bedroom with a full bed and two single beds.